The following criteria apply to the judging categories for both Professionally Judged (prizes) and GVQC Member (ribbons) entries. 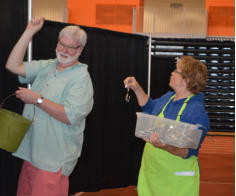 See Judging Categories and Entry Criteria . 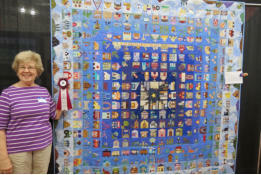 A quilt must be entered in one of the judging categories detailed below. Note: Pieced quilts have a further designation as Simgle Maker or Multiple Maker. 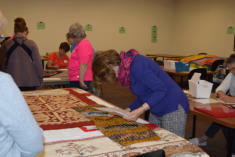 Note: Youth must be sponsored by a GVQC member and are entered as “Youth” regardless of the type or size of the quilt. Small – Any side less than or equal to 36”, total perimeter less than or equal to 144”. Any technique. Art – Your original design reflecting innovative construction and design techniques, theme or subject matter and/or materials. No commercial patterns, kits or copies of previous works. Applique – Applique predominates over other techniques in amount or effect. Any applique quilt larger than 36” on a side, total perimeter greater than 144”. Pieced – Piecing predominates over other techniques in amount or effect. Any pieced quilt larger than 36” on a side, total perimeter greater than 144”. 1. Single Maker – A quilt that has one (1) person involved in its completion. Includes all techniques, as well as quilting. 2. 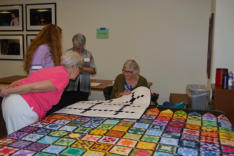 Multiple Maker – A quilt where more than one (1) person was involved in its completion. Includes all techniques, as well as quilting by a person other than the maker of the top. Special Techniques- This category is defined as a wholecloth (both computer and non-computer generated designs), Crazy Quilts, or embroidered quilt. If the quilt is not one of these three types, it must be entered into a different category. No size restriction. Modern Quilts (available only for GVQC Members) - A modern quilt is inspired by modern design which includes use of bold colors and prints, high contrast and graphic areas of solid color, expansive negative space and improvisational piecing. 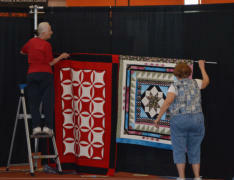 It may include an updating of classic quilt designs. No size restriction. Ribbon award for 1st, 2nd, 3rd, and Honorable Mention. Homestead in Painted Post, NY. quilts selected by the quilt judges. 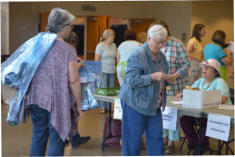 The following criteria apply to the judging categories for both Professionally Judged (prizes) and GVQC Member (ribbons) entries. See Judging Categories and Entry Criteria. A quilt must be entered in one of the judging categories detailed below. Note: Pieced quilts have a further designation as Simgle Maker or Multiple Maker. 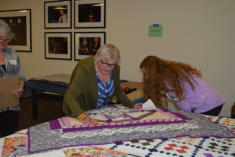 Note: Youth must be sponsored by a GVQC member and are entered as “Youth” regardless of the type or size of the quilt. Small – Any side less than or equal to 36”, total perimeter less than or equal to 144”. Any technique. Art – Your original design reflecting innovative construction and design techniques, theme or subject matter and/or materials. No commercial patterns, kits or copies of previous works. Applique – Applique predominates over other techniques in amount or effect. Any applique quilt larger than 36” on a side, total perimeter greater than 144”. Pieced – Piecing predominates over other techniques in amount or effect. Any pieced quilt larger than 36” on a side, total perimeter greater than 144”. 1. Single Maker – A quilt that has one (1) person involved in its completion. Includes all techniques, as well as quilting. 2. 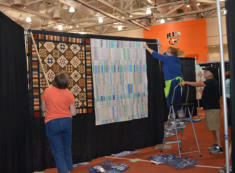 Multiple Maker – A quilt where more than one (1) person was involved in its completion. Includes all techniques, as well as quilting by a person other than the maker of the top. Special Techniques- This category is defined as a wholecloth (both computer and non- computer generated designs), Crazy Quilts, or embroidered quilt. If the quilt is not one of these three types, it must be entered into a different category. No size restriction. Modern Quilts (available only for GVQC Members) - A modern quilt is inspired by modern design which includes use of bold colors and prints, high contrast and graphic areas of solid color, expansive negative space and improvisational piecing. It may include an updating of classic quilt designs. No size restriction. selected by the quilt judges.